If you have always wondered how to make dumplings so they are light and lovely every time, this recipe is for you. If you are making a stew, either beef, chicken or vegetable, this is one of the nicest side dish recipes you can serve. The delightful part is that it cooks right with the stew. Measure the flour, parsley, baking powder and salt in a medium bowl. Cut the shortening into this mixture, using a pastry blender or crisscrossing 2 knives, until the mixture looks like fine crumbs. Stir in the milk. Drop the dough by 10 to 12 spoonfuls onto hot meat or vegetables in a boiling stew (do not drop directly into liquid) Cook, uncovered, for 10 minutes. Cover and cook another 10 minutes. If you are using self-rising flour, omit the baking powder and salt. These little gems really do need to be cooked in an environment that provides a steam but doesn’t boil them. That is why they are usually cooked in a stew. 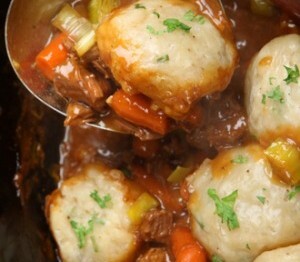 Just spoon them on top of the stew and let them cook, partly with the lid off, then covered for an equal amount of time. This is a really easy side dish recipe. The dumplings should come out light and fluffy. Dumplings are a great change from potatoes or rice. 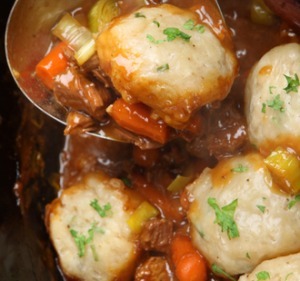 Try beef stew with dumplings. The stew recipe is here. All of our potato, rice, noodle and other side dish recipes are here.